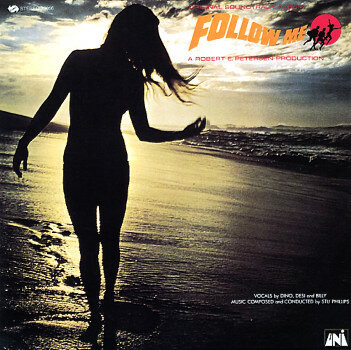 The 433rd Soundtrack of the Week is Stu Phillips's music for Follow Me. First is "Thru Spray Colored Glasses", a sunny pop song of a style that's very much of the late 1960s. This plays for the prologue and is reprised at the end for a Hawaii segment. "Thru spray colored glasses / The world seems so beautiful and I know / that you will just free your mind / and soon you'll be on your way with us / won't you stay with us?" Then we're off to Portugal. In "Qual E O Caminho Da Praia" the "Thru Spray Colored Glasses" is played in a different, instrumental arrangement with a couple of new sections added. Then something more dramatic and suspenseful sounds like it's happening in "Guincho", which also uses the "Glasses" melody and changes meters and feels. "Nazarae" alternates between 3/4 and 6/8 and features some great guitar and harpsichord playing as well as some excellent writing for strings and wordless vocals. Things get dreamy and sprightly with the 7/4 piece "Cascais", another one with great acoustic guitar soloing. From there we go to Morocco for "Camel Farm", which combines traditional sounding Middle Eastern modes and instruments with a more acid rock backbeat and mild freak out, as well as a restatement of the "Glasses" theme. Next up is "Goyapana" for the Ceylon segment. It begins with percussion and an elephant cry. That ethereal wordless chorus is back and creates an otherworldly atmosphere with subtle use of thumb piano and other percussion. There's a cross fade into another sunshiney sort of trippy jazz waltz pop number. "Interlude: Like the Wind and Sea" is that song again, this time with lyrics, cool electric piano solo and a surf guitar riff. "When you're flying high / When you're flying high / See the world go by / See the world go by / When you're flying high." Then we're off to India on the "Ranee Express", which begins with train sounds and brings in the expected instruments, tabla, tambura, sitar etc., accompanied by string section. This is followed by "Mahahbalipuram" which starts with an Indian-sounding section with interesting rhythms and phrasing before relaxing into a funky back beat with percolating pizzicato strings. For "Big Wave Bay" Hong Kong comes blasting in with a rocking 4/4 arrangement of "Like the Wind and Sea" with a couple obvious "Chinese" touches and really nice electric piano solo (sounds like Fender Rhodes to me). There's a surprising touch of intentional dissonance in the vocals at one point. And we end with Hawaii. The first cue, "Incinerator", has layers of percussion and repeated figures on top, creating an intricate platform for Phillips's lyrical writing to float over. Then we get another sunny groovy pop song, "Just Lookin' for Someone". "Any day is a day for me / Any way is a way to be / Checkin' out all the good locations / I'm pickin' up on the love vibrations." "Waimea" ends the Hawaii section and is mostly eerily droning organ and some spacy echoing percussion. It builds until it shifts into more conventional underscore.